(Nanowerk News) Scientists at Princeton University used off-the-shelf printing tools to create a functional ear that can "hear" radio frequencies far beyond the range of normal human capability. 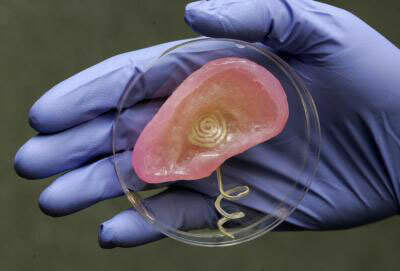 Scientists used 3-D printing to merge tissue and an antenna capable of receiving radio signals. "In general, there are mechanical and thermal challenges with interfacing electronic materials with biological materials," said Michael McAlpine, an assistant professor of mechanical and aerospace engineering at Princeton and the lead researcher. "Previously, researchers have suggested some strategies to tailor the electronics so that this merger is less awkward. That typically happens between a 2D sheet of electronics and a surface of the tissue. However, our work suggests a new approach -- to build and grow the biology up with the electronics synergistically and in a 3D interwoven format." McAlpine's team has made several advances in recent years involving the use of small-scale medical sensors and antenna. Last year, a research effort led by McAlpine and Naveen Verma, an assistant professor of electrical engineering, and Fio Omenetto of Tufts University, resulted in the development of a "tattoo" made up of a biological sensor and antenna that can be affixed to the surface of a tooth. This project, however, is the team's first effort to create a fully functional organ: one that not only replicates a human ability, but extends it using embedded electronics. "The design and implementation of bionic organs and devices that enhance human capabilities, known as cybernetics, has been an area of increasing scientific interest," the researchers wrote in the article which appears in the scholarly journal Nano Letters (" A 3D Printed Bionic Ear"). "This field has the potential to generate customized replacement parts for the human body, or even create organs containing capabilities beyond what human biology ordinarily provides." Standard tissue engineering involves seeding types of cells, such as those that form ear cartilage, onto a scaffold of a polymer material called a hydrogel. However, the researchers said that this technique has problems replicating complicated three dimensional biological structures. Ear reconstruction "remains one of the most difficult problems in the field of plastic and reconstructive surgery," they wrote. Manu Mannoor, a graduate student in McAlpine's lab and the paper's lead author, said that additive manufacturing opens new ways to think about the integration of electronics with biological tissue and makes possible the creation of true bionic organs in form and function. He said that it may be possible to integrate sensors into a variety of biological tissues, for example, to monitor stress on a patient's knee meniscus. David Gracias, an associate professor at Johns Hopkins and co-author on the publication, said that bridging the divide between biology and electronics represents a formidable challenge that needs to be overcome to enable the creation of smart prostheses and implants. "Biological structures are soft and squishy, composed mostly of water and organic molecules, while conventional electronic devices are hard and dry, composed mainly of metals, semiconductors and inorganic dielectrics," he said. "The differences in physical and chemical properties between these two material classes could not be any more pronounced." The finished ear consists of a coiled antenna inside a cartilage structure. Two wires lead from the base of the ear and wind around a helical "cochlea" – the part of the ear that senses sound – which can connect to electrodes. Although McAlpine cautions that further work and extensive testing would need to be done before the technology could be used on a patient, he said the ear in principle could be used to restore or enhance human hearing. He said electrical signals produced by the ear could be connected to a patient's nerve endings, similar to a hearing aid. The current system receives radio waves, but he said the research team plans to incorporate other materials, such as pressure-sensitive electronic sensors, to enable the ear to register acoustic sounds. In addition to McAlpine, Verma, Mannoor and Gracias the research team includes: Winston Soboyejo, a professor of mechanical and aerospace engineering at Princeton; Karen Malatesta, a faculty fellow in molecular biology at Princeton; Yong Lin Kong, a graduate student in mechanical and aerospace engineering at Princeton; and Teena James, a graduate student in chemical and biomolecular engineering at Johns Hopkins. The team also included Ziwen Jiang, a high school student at the Peddie School in Hightstown who participated as part of an outreach program for young researchers in McAlpine's lab. "Ziwen Jiang is one of the most spectacular high school students I have ever seen," McAlpine said. "We would not have been able to complete this project without him, particularly in his skill at mastering CAD designs of the bionic ears."